Children love to listen...but even more, they love to participate. Me Too! Books invite your young child to join in the fun by pointing, repeating, filling in, making sounds, repeating aloud and answering questions. Little ones can learn so much! But best of all, these books present Bible stories and truths in simple words a young child can understand. Me Too! Books make it easy for your little one to learn about God. 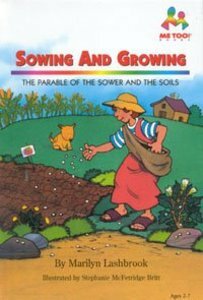 About "Sowing and Growing (Me Too! Series)"
Customer Reviews For "Sowing and Growing (Me Too! Series)"
Every child needs to read this series!! This was honestly the best series of books I ever read as a child - I absolutely loved this book and all the others in the series. They are so well illustrated and written - easy for any child to clearly understand the bible stories and grow a love for learning about God! The perfect childhood book by far that truly teaches kids the bible stories!